It’s not new – the best, most reliable and clear telephone service has long been delivered over fiber optic networks. 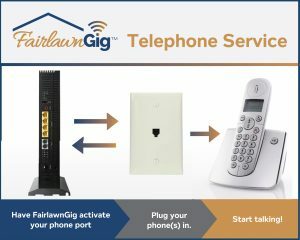 That’s why FairlawnGig’s fiber connection to your home can also bring you telephone service effortlessly, with the same phone number you’ve always had! Your current phone handsets work seamlessly with your FairlawnGig connection. Transferring your current phone number to FairlawnGig is fast and easy with minimal interruption of your phone service. FairlawnGig can issue you a new phone number if you prefer.